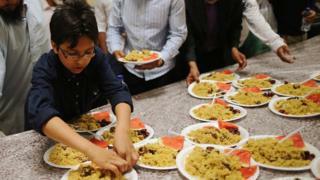 What's it like for a family fasting during Ramadan? The Islamic holy month of Ramadan has begun. Read on to find out more about what Muslims do during this month and why it is so important. During the month of Ramadan, Muslims won't eat or drink between dawn and sunset. This is called fasting. Fasting is important during Ramadan as it allows Muslims to devote themselves to their faith and come closer to Allah, or God. It is common to have a meal (known as the suhoor) just before dawn and another (known as the iftar) directly after sunset. At the end of the fast - when the sun has gone down - families and friends will get together for iftar to break their fast. Many Muslims also go to the mosque to pray. Why does it fall now? Ramadan falls during this month because this is when the holy book that's followed by Muslims, called the Qur'an, was first revealed to the Prophet Muhammad. Ramadan is the ninth month of the Islamic calendar, but the date changes each year. This is because Islam uses the lunar calendar (based on the cycles of the moon), so it isn't a fixed date in the Western/solar calendar. Not everybody fasts during Ramadan. Children, pregnant women, the elderly and those who are ill or who are travelling don't have to fast. 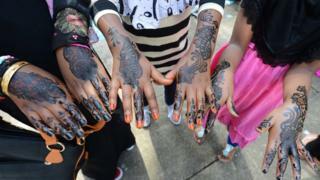 There is a special three-day festival to mark the end of Ramadan. This is called Eid al-Fitr - the Festival of the Breaking of the Fast. It begins when the first sight of the new moon is seen in the sky. Muslims will not only celebrate the end of fasting, but will also thank Allah for the help and strength that he gave them throughout the previous month. Often children are given presents and new clothes.